Supplier & trader of Demineralisation plant performs efficiently in purifying and removing varieties of impurities from water. Our product range also comprises of Oxygen Generator, so that they find application in various sectors.Equipped with advanced filters, our demineralisation plant helps in faster removal of pesticides. With the thorough knowledge and experience of this domain, we are engaged in manufacturing of Water Demineralisation Plantwhich works on the principle of ion exchange technology. These products have a resin bed which helps in removal of contaminants using chemical ion exchange and the resin bed is backwashed by a strong solution of base cation and anion of its recharging. Using this process we can also remove the hardness of water as hardness causing ions like sodium, calcium, magnesium and aluminum are also removed during the purification. We are the manufacturers of Rapid Flow Two Bed DM Plants. The latest Nishu Enterprise SuperFlow Two Bed DM Plants Auto comprises a family of automatic twin-bed deionisers, incorporating state-of-the-art counter flow ion exchange technology.The operational cycle of these rapid-regeneration, packaged units is controlled by volume throughput, which is pre-programmed into the PC according to the type of feed water. The ion exchange resins are never fully exhausted ensuring optimum deionized water production at all times.Regeneration takes just 30 minutes after a minimum service cycle of two hours minimizing the need for both standby plant and the storage of large volumes of water. As regeneration of the cation and anion beds is simultaneous, the effluent streams are largely self-neutralizing, reducing waste disposal costs and environmental impact.The System is exceptionally compact, and is skid mounted on a corrosion-resistant frame which also accommodates a stainless steel multipurpose pump. In addition to optimizing the performance of the plant during service and regeneration, the pump provides a number of recirculation options to maintain the high quality of the water in the treated water tank. provide up to 400 m3/day on a feed water of 100 ppm total anion feed. Average resistivity of purified water is 0.5 mS/cm, with low running costs. 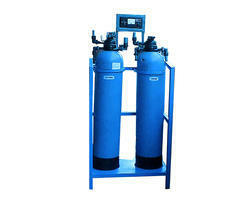 High chemical efficiency - high purified water output from low regenerate chemical usage. Smaller footprint and higher flow rates than conventional plant. Reduced outage time can often eliminate the need for duplex plant. Near neutral effluent reduces disposal costs. Flow display provides information on flow rates, throughput and number of regenerations. Can be connected to level sensors in chemical tanks to prevent regeneration when insufficient chemicals are available. Minimal installation and commissioning costs. 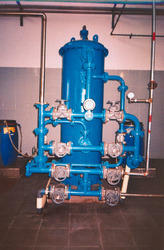 We are the manufacturers of DM Water Plant. NISHU ENTERPRISE offers DM Plant in various sizes ranging from 500 ltrs/hr up to 100 m3/hr and above. These are manufactures using FRP pressure vessel, internal distribution and collection system, multi-port or individual valves, piping, century for acid or alkali injection, solution tanks, for acid and caustic, test kit, conductivity meters etc.These units are available with multi-port or individual valves.We offer poly styrene di-vinyl benzene (resin) of either ion exchange make or lanxess make for better water quality. Solution tank of required volume and test kit for water quality check. We are the manufacturers of Mixed Bed DM Plants. Our clients can avail from us a premium quality range of Mixed Bed DM Plants Auto - Mild Steel Rubber Lined,which are having mild steel rubber lined construction and we offer these units for various industrial applications. These are suitable for varied capacity and we deliver these within stimulated time frame and our products are available as per the industrial standards. Thus, we offer these solutions with best quality as well as effective performance and are widely known for their easy installation. 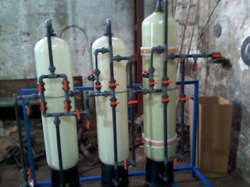 These units are generally installed in series with two bed DM plant or reverse osmosis unit as as post treatment or as a polisher unit to get ESS than 1 micro siemens/cm conductivity water or even for 0.05 conductivity water or 18 mega ohms water when operated in series for various industry. These units are also available in Stainless Steel and FRP. Systems are either offered waith auto Valve Battery or Manual Valves depending on the requirement. 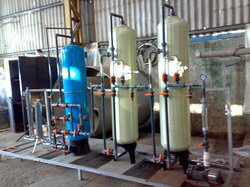 We are the manufacturers of Two Bed DM Water Plants Auto FRP. We are specialized in manufacturing and supplying a comprehensive range of Two Bed DM Water Plants Auto FRP, which are available for the water demineralization along with the process of ion exchange. Our products are highly appreciated for their easy installation and we offer these products as per the given information by our clients. We manufacture these products using modern machines and equipment and these are available in compact designs. We are offering of Mild Steel Rubber Lined Two Bed DM Water Plants. NISHU ENTERPRISE offers Mild Steel Rubber Lined Two Bed DM Water Plants in various sizes ranging from 500 ltrs/hr up to 100 m3/hr and above. These are manufactures using mild steel rubber lined pressure vessel, internal distribution and collection system, multiport or individual valves, piping, ventury for acid or alkali injection, solution tanks, for acid and caustic, test kit, conductivity meters etc.These units are available with multiport or individual valves.We offers poly styrene di-vinyl benzene (resin) of either ion exchange make or lanxess make for producing better water quality. Systems are offered with Pre Filtration for removal of Suspended Impurities and Organic Impurities and Reverse Osmosis Unit as well for Higher TDS to economize on Regeneration Chemicals. Treated water quality at the outlet of the unit is having conductivity less than 10 – 30 micro siemens/cm with alkaline ph depending on in-feed TDS. We are the manufacturers of Mild Steel Mixed Bed DM Plants. With the help of our hi-tech infrastructure set-up, we manufacture and export a competitive range of Mixed Bed DM Plants - Mild Steel Rubber Lined, which are available as per the given information by our clients. These products are available at industry leading prices to our clients. Our products are available for the demineralization of water and we offer these products in a cost effective as well as efficient manner to our clients. We are the manufacturers of Rapid Flow Two Bed DM Plants FRP. NISHU ENTERPRISE offers Rapid Flow Two Bed DM Plants FRP in various sizes ranging from 500 ltrs/hr up to 40 m3/hr. These are manufactures using FRP pressure vessel, internal distribution and collection system, multiport or individual valves, piping, ventury for acid or alkali injection, solution tanks, for acid and caustic, test kit, conductivity meters etc. These units are available with multiport or individual valves. We offers special resin to withstand higher velocities at less TDS water. When operated with low TDS water up to 100 ppm or with ro system as a feed water system, these units perform to their best providing required water quality. Treated water quality at the outlet of the unit is having conductivity less than 30 micro siemens/cm with alkaline ph depending on in-feed tds. 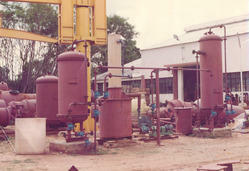 We are the manufacturers and exporters of FRP De Gasification Systems. Water having carbonic acid are passed through the Degasser Towers which contains pall rings to give little obstruction to the water flowing down, Air blwo in upward flow removes the carbon dia-oxide frm water leaving purified water. This system is used mainly alongwith Two Bed DM Plant having Cation and Anion Units and is installed after Cation Column where CO2 is stripped out leaving purified water to reduce the load on Anion Column thus reduces the Resin regenaration quantity of NaOH (Sodium Hydroxide). 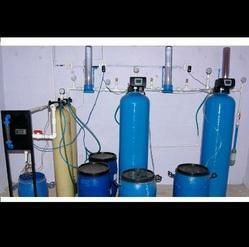 This system is also used for Post RO system to increase the pH level of RO Treated Water. System is available frm 200 mm dia producing 1000 LPH flow rate up to 1200 mm dia and more for bigger flow rates. 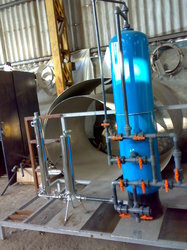 We are the manufacturers of De-Ionisation Plants. NISHU ENTERPRISE offers Electro De-Ionisation Plants to produce ultra pure water for various application including pharma, power plants etc. aguapuro offers these units as end use system as a post treatment with reverse osmosis unit or two stage reverse osmosis unit or with ro followed by dm plant. 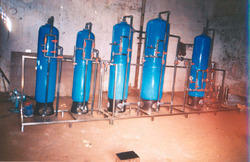 These units are used for production of ultra pure water having conductivity of less than 1 or 0. 05 micro siemens /cm. units are offered with multiple edi cell for higher flow rates. W e use the best quality ion-pure or snow-pure modules for edi plants. piping done on the system is exclusively ss 316 with orbital welding for pharma applications. 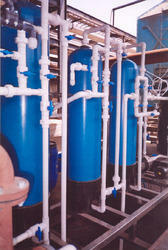 We are the manufacturers of Two Bed DM Water Plants. 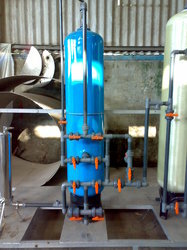 NISHU ENTERPRISE offers de-mineralisation systems for flow rates up to 200 m3/hr.Two Bed DM Water Plants Auto - Mild Steel Rubber Lined systems are provided with combination of various units which includes weak acid cation exchanger unit, strong acid cation exchanger unit, degasification unit, weak base anion exchanger unit, strong base anion exchanger unit followed by mixed bed DM plant for further polishing of treated water. We are the manufacturers of Mixed Bed FRP DM Plants. NISHU ENTERPRISE offers Mixed Bed DM Plants in various sizes ranging from 500 Lit/hr up to 140 m3/hr and above. 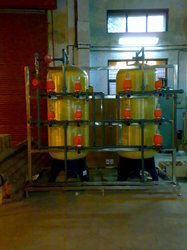 These are manufactures using FRP pressure vessel, internal distribution and collection system, multi port or individual valves, piping, venture for acid or alkali injection, solution tanks for acid and caustic, test kit, conductivity meters etc.These units are available with multi port or individual valves.We offers poly styrene di-vinyl benzene (resin) of either ion exchange make or laxness make for better water quality. Treated water quality at the outlet of the unit is having conductivity less than 1 – 2 micro Siemens/cm with neutral ph. Looking for Demineralisation Plant ?